Second Life is an online virtual world, developed by Linden Lab, launched on June 23, 2003. 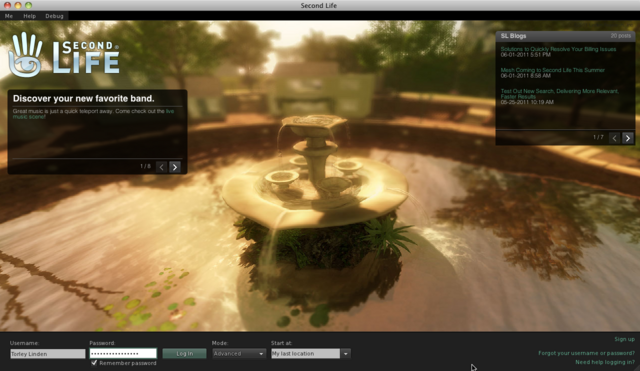 A number of free client programs, or Viewers as they are called in Second Life are used to access the Second Life world. The users in Second Life, called Residents, can interact with each other through avatars. Residents can explore the world (known as the grid), meet other residents, socialize, participate in individual and group activities, and create and trade virtual property and services with one another. Second Life is intended for people aged 16 and over, with the exception of 13–15-year-old users restricted to the Second Life region of a sponsoring institution (e.g. school). Built into the software is a three-dimensional modeling tool based on simple geometric shapes that allows residents to build virtual objects. There is also a procedural scripting language, Linden Scripting Language, which can be used to add interactivity to objects. Sculpted prims (sculpties), mesh, textures for clothing or other objects, animations, and gestures can be created using external software and imported. The Second Life terms of service provide that users retain copyright for any content they create, and the server and client provide simple digital rights management (DRM) functions. However, Linden Lab changed their terms of service in August 2013, to be able to use user-generated content for any purpose. The new terms of service prevents users from using textures from 3rd-party texture services, as some of them pointed out explicitly. Users can also photograph in Second Life with the camera technology the client programs have. You could be a Taluna! Don’t let the learning curve stop you! Everyone was a nuub at one time!